CHECK OUT OUR AG GALA 2018 HIGHLIGHT VIDEO! A little teaser video that shows how much fun we were having. 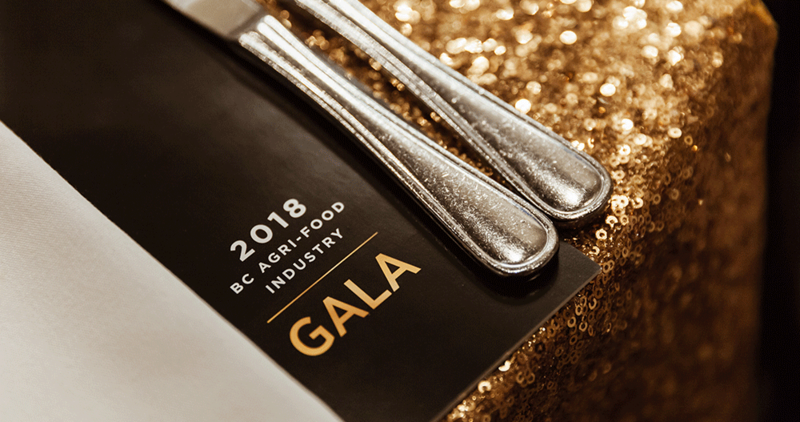 The BC Agri-Food Industry Gala is an annual fundraising event hosted by BCAC that brings together farmers, ranchers, agri/aqua-food leaders and industry stakeholders from around the Province to celebrate and discuss agriculture in British Columbia. Thank you to all those who generously donated gifts for our silent auction and also the winners! This year's silent auction raised nearly $10,000! Proceeds from the silent auction went to BC Agriculture in the Classroom. Photos from this year's gala are now online and can be found on by CLICKING HERE! Recognizing his career in agriculture communications and journalism. This "Champion" award is to recognize an individual who has made outstanding contributions to agriculture. The recipient of this award tonight has been a leader within BC’s farm writing community for over 30 years. His commitment to the revitalization and leadership of the BC Farm Writers’ Association and the farm writing community in BC has been unwavering since he joined the organization in 1985. His skill as a farm journalist is recognized and respected across commodities and throughout the province. "Tonight I have the opportunity to tell you about a teacher who expands the learning in sciences and built the Sardis Secondary School Farm, she is: Tania Toth. The Chilliwack School District is fortunate to have a piece of property in the ALR and Tania and her colleagues saw this as an opportunity to build practical applications into studies in science, sustainable resources 11, teaching hands-on agriculture practices. At the Sardis Secondary School farm students learn to grow a variety of vegetables sustainably. They learn water conservation, integrated pest management practices, as well as the marketing of their products. They sell back into the school’s culinary arts program and into the local community through their (CSA) community supported agriculture box program, learning business skills. More recently they have added the mentorship program where secondary school students teach elementary students to grow food. Tania is excited to ignite the curiosity and interest in growing food in young people. She says, “It’s not often in anyone’s career that you get the opportunity to be creative, and build something that gives you personal satisfaction, and is so positive for students.” She is proud of the community support, volunteer farmers that lend expertise and mentorship, and mostly proud of the new interests students develop in agriculture. She welcomes any of you, especially those in Chilliwack, who would like to take part in her exciting educational journey in Agriculture. We at BC Agriculture in the Classroom also thank you for your support in the silent auction tonight to be able to get schools growing in agriculture like Tania’s. For her dedication and infectious enthusiasm at the Sardis Secondary School Farm, BC Agriculture in the Classroom Foundation is pleased to award Tania Toth as the outstanding teacher of the year. Recognizing Kevin’s leadership during the 2017 wildfires where he went beyond the call of duty. "This is a unique award this year as it is to give special recognition to an individual who went above and beyond their call of duty. The summer of 2017 was the largest fire season that British Columbia has ever witnessed. As many of you know, wildfires can impact anyone, but this year, the impact to B.C. Farmers and Ranchers was devastating. The individual recognized tonight not only helped ranchers and farmers who were evacuated off their farms, he was there for those who chose to stay and fight - to get their hay off, or move their livestock. He worked as many hours as it took to get the job done, with class and with very little sleep. He quickly became the voice of agriculture – multiple stakeholders would be reaching out for an update, a comment, advice or suggestions. All levels of government were more than willing to work with him. He demonstrated excellent problem-solving abilities for the agriculture industry, the local producers and those managing the fire. Many have said his calm demeanor helped them focus on the bigger picture. Now he is part of another wildfire chapter – the rebuilding of what was lost. Currently, he is collaborating with other livestock associations to develop a resource network throughout the province to assist them when emergency situations occur. This is in addition to ongoing efforts in predator control, refencing and reseeding projects. It is no doubt that the work he has done this summer will affect how wildfires are fought in this province. This special recognition award is for Leadership in Agriculture and I am honoured to present it to Kevin Boon, Executive Director from the BC Cattlemen’s Association". The BCAC Award for Excellence in Agriculture Leadership is designed to honour leaders in the agriculture industry who have exemplified personal values, performance and achievement in BC’s farm community. The award recognizes the high standards of conduct, leadership, integrity, innovation and accomplishment within the agriculture and agri-food sector. The recipient of this year's award has made significant contributions both at the commodity level and pan-agriculture level. He has been an integral part of the BC poultry sector for many years and the list of the committees and programs where he played a lead role was over a page long so we won’t list the off for you! During the 2014/2015 Avian Influenza outbreak, he served as the incident commander where he attended daily meetings with the federal joint emergency operations centre as the sole industry rep. This was the first time that industry was able to be part of the emergency operations centre. Under his leadership, he worked tirelessly within the poultry sector to develop many long-term solutions to a possible future AI outbreak and how to manage under a crisis. On the pan-agriculture level, he was a BCAC Board member for 10 years and was appointed as BCAC's rep on the Canadian Federation of Agriculture Board for his entire term. During his 6 years as BCAC Chair, he was instrumental in the battle over farm assessments – farm buildings were once again classified as farm buildings as opposed to the same classification as residences. This person needs no introduction – but for the sake of formality…on behalf of BC Agriculture Council, it is our honour to present the Excellence in Agriculture Leadership award to Garnet Etsell".